Preheat oven to 350°F degrees. Lightly spray shallow baking pan with non-stick vegetable spray. Stir together 1/4 cup sugar and warm water. Stir until sugar dissolves. Add pecans; let soak for 10 minutes. Drain water and discard. Stir together remaining 2 tablespoons sugar, cocoa, chili powder and cayenne pepper in medium bowl. Add pecans and toss until all cocoa mixture coats pecans. Spread coated pecans on prepared baking pan. 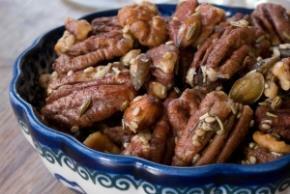 Bake for 10 to 15 minutes or until pecans start to glisten and appear dry. Stir occasionally while baking. Cool completely. Store in cool, dry place for up to 2 weeks.